The downtown area of Montreal, Quebec is easily accessible from the waterfront and is beautiful in the lighting at dusk when the skyline becomes illuminated by thousands of lights. From the Jacques-Cartier Basin, alongside the marina, the scenery is picturesque as the reflections of the lights dance with the movement of the water. 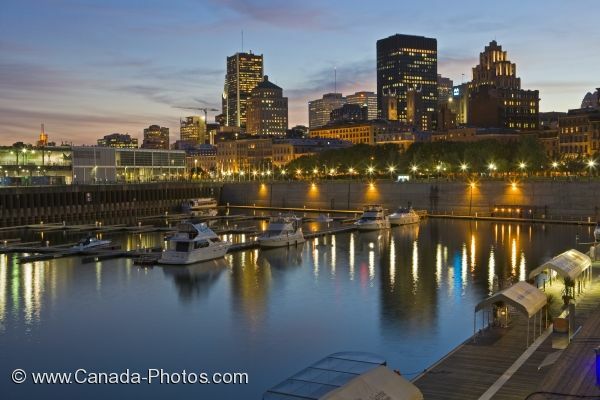 The marina becomes busier during the summer months when boats come in to moor for the evening so that the passengers can explore the downtown core of Montreal city. Above the marina, a parkland was created which was completed in 1992 creating the ideal place for people to relax, learn some of the heritage of Montreal City, walk, skate, bike or jog. Picture of the lighting at dusk of downtown Montreal and the marina as seen from the Jacques Cartier Basin in Quebec. ... The lighting display at dusk provides the ideal atmosphere for a romantic stroll or a serene place to sit and enjoy the scenery. Downtown Montreal seen from the Jacques-Cartier Basin in Old Montreal and Old Port at dusk, Montreal, Quebec, Canada.